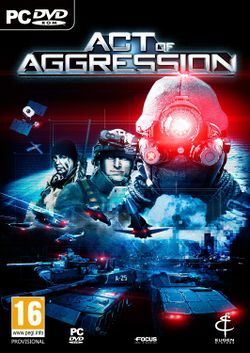 Act of Aggression is a real time strategy game produced by Eugen and published by Focus Interactive. It is a real-time strategy game hailing from the Golden Era of RTS with a few modern twists. It plays similarly to older real time strategy games, though on larger scale battlefields than its contemporaries. The game follows the United Nations-backed Chimera task force as they ally with the USA and fight a mysterious enemy called the Cartel. Intended to be a throwback to the golden age of RTSes, the game has had a number of difficulties attracting its intended audience. Critics have cited difficult unit control, a poor single player campaign, high price point, and lack of tutorial to make it a difficult game to understand. It has often been compared to Command & Conquer Generals. Resource management and aircraft handle considerably differently than other similar games. It has more in common in this regard to Eugen's other games, the Wargame series. Unlike Wargame: Red Dragon, Act of Aggression has been stated to not support naval units. For additional information on Act of Aggression's differing features, see the Getting Started page. It has been stated here that a "much different version of the game" is currently being worked at, but no further details are available yet. This page was last edited on 26 January 2018, at 00:45.